The game will be publicly available for all students and anonymous visitors on Helpfulgames. We are grateful for every game that you make public, but we are very nursing about the quality of our game and please make sure it follows our rules for public games. 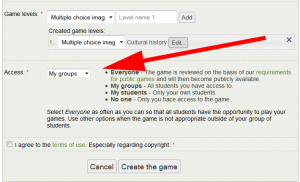 Everyone can access the game through the usual public subject pages, but your students and your group’ students may also see it on the member page Games by teachers. Create a group and invite another teacher. When the teacher adds a student in your group, the student will gain access to all of your game that has this access level. 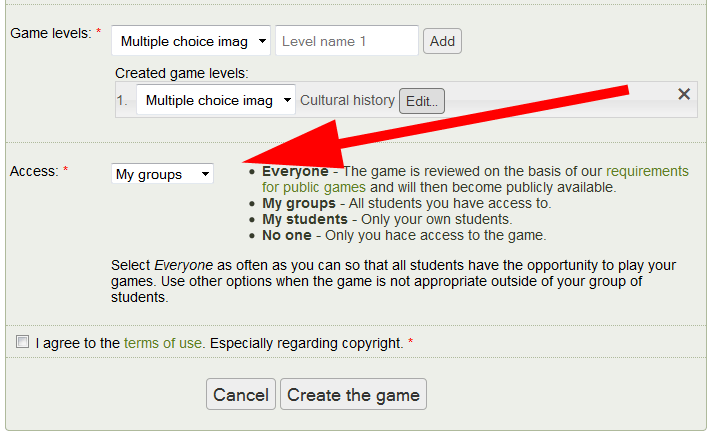 All your students have also access to the game, regardless of their status in your groups. Your students and your group’ students can access the game through the usual public subject pages, but also on the member page Games by teachers. Anonymous visitors or not connected users have no access to play the game. Only your students that you are responsible for have access to the game. Students that you are connected to through groups have no access to the game. Your own students can access the game through the usual public subject pages, but also on the member page Games by teachers. Only you have access to play the game. This level is often used during game design. This entry was posted in New site function by Daniel.